Robin Maynard has spent over 30 years working in the environment movement – starting as a volunteer at Friends of the Earth (FOE) just before the Chernobyl disaster. That grim event led to his first paid environmental job tracking radioactive fall-out across the UK, finding more extensive contamination than officially admitted, so securing greater compensation for affected farmers. Holding senior campaign posts at FOE, Soil Association, FARM, and the Wildlife Trusts, Robin also spent a stint producing and presenting BBC Radio 4’s Farming Today; as well as providing pieces for Costing the Earth. 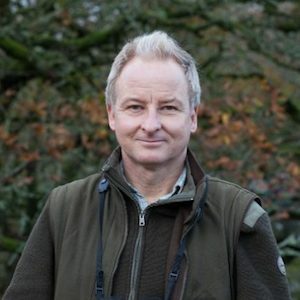 From 2009 – 2010, he worked as director of communications for the Forestry Commission, resigning at the then government’s proposal to flog off the entire public forest and woodland estate in England. Along with other environmentalists and concerned foresters, he set-up Our Forests which, supported by grassroots groups, forced the first policy U-turn of the Coalition Government. During 2012 -13, working with Jonathon Porritt he sought to persuade environment and conservation groups to talk humanely and honestly about human population pressure and its impacts upon our planet, alongside the more routinely considered factor of human consumption – with limited, success! Presently, he is director of Population Matters.